I was born in the Medford Community Hospital (now the Century Building) on East Main Street in Medford, Oregon. At the time, my parents (Shirrel and Fredene Doty) and my older brother Dave were living on King Street, but soon moved across town to our home on Keene Way Drive. I was the reason. The family had grown. More bedrooms were needed. This is the home I grew up in for nearly 18 years. 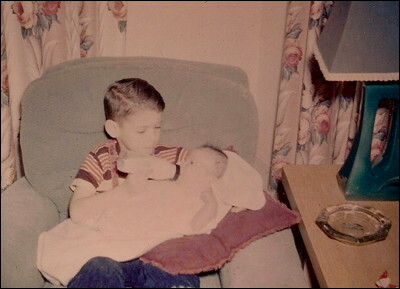 The photo shows my brother Dave giving me my bottle feeding in early January, 1953. I'm a month old. The photo was taken at my grandparents home (Fred & Maude Daugherty) on Kings Highway on the outskirts of Medford.